Snow and Tanner crabs naturally crossbreed. The young display traits from both parents. Female Tanner crab mate with adult males for the first time during their last molt (maturity molt). The male crab is attracted by a chemical attractant (pheromone) released by the female. Females molt to sexual maturity and mate in the softshell condition while grasped by the male. Older hardshelled females are also mated by adult males, but in the absence of a male they are capable of producing an egg clutch with sperm stored from a previous mating. A female Tanner crab may deposit 85,000 to 424,000 eggs in a clutch. Fertilization is internal, and the eggs are usually ovulated (extruded) within 48 hours onto the female's abdominal flap where they incubate for a year. Hatching occurs late the following winter and spring with the peak hatching period usually during April to June. This is normally the peak of the spring plankton bloom, so egg hatch coincides with the high availability of food for the larvae crab. The young, free-swimming larvae molt many times and grow through several distinct stages. Growth during this period is usually dependent on water temperature but lasts about 63 to 66 days, after which the larvae lose their swimming ability and settle to the ocean bottom. After numerous molts and several years of growth, females mature at approximately 5 years of age while males mature at about 6 years. Tanners may live to an estimated maximum age of 14 years. Tanner crabs are two of the four species of the genus Chionoecetes occurring in the eastern North Pacific Ocean and Bering Sea. They form the basis of a thriving domestic fishery from southeastern Alaska north through the Bering Sea. These crabs are also marketed under their trade names: snow crab (C. opilio) and Tanner crab (C. bairdi). Migration patterns are not well understood; however, it is known that the sexes are separated during much of the year and move into the same areas during the reproductive season. Tanner crabs feed on a wide assortment of marine life including worms, clams, mussels, snails, crabs, other crustaceans, and fish parts. They are fed upon by bottomfish, pelagic fish, and humans. The Tanner crab populations are managed for maximum sustainable yield, and as such, are stable. The principle threat to Tanner crab stocks in Alaska is Bitter Crab Disease (BCD). By the 1984/1985 season, processors handling crab from the extreme north end of Southeast Alaska, notably Lynn Canal, were receiving complaints from consumers of bitter crab meat. Most management staff thought it was associated with a normal pre-molt condition in Tanner crab. However, a few samples of crab blood collected during the 1985/1986 season revealed that the bitterness was closely correlated with presence and concentration of a systemic parasite – a highly specialized dinoflagellate of the genus Hematodinium. Symptoms associated with BCD had been reported since at least the early 1980s, with some anecdotal references to off-tasting Tanner crabs dating back to the mid-1970s. Fishermen have since reported incidence of BCD from most major fishing grounds in Southeast Alaska and sporadically from other areas as well. Its definitive identification in Bering Sea snow crab (C. opilio) stocks, with the economic implications, has accelerated research on Hematodinium. Hematodinium infects all sizes and both sexes of Tanner crab, and appears to kill them within one to 1.5 years. It severely reduces the vitality and reproductive capacity of crabs, with egg clutches of infected females being greatly reduced in size, but the mechanism and seasonal timing of transmission remains unknown. The disease may spread by free-living, infected spores released by dying crabs, or vegetative stage organisms passively transmitted during periods of crab aggregation, such as immediately before and during seasonal mating periods. 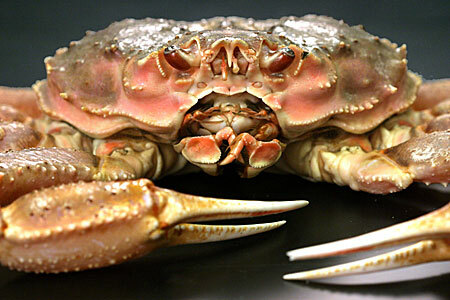 Crabs in later stages of infection cannot be marketed because of the astringent taste and soft, chalky texture of the meat. These crabs can be identified on the fishing grounds by external symptoms such as the abnormal pink or pale coloration of their abdomens and the ventral sides of their walking legs. Text: Bishop, G. H., J. Rumble, and S. E. Merkouris, 2002, Report to the Board of Fisheries: Southeast Alaska Tanner Crab Fisheries, Regional Information Report No. 1J02-14, Alaska Dept. of Fish and Game. The Tanner crab fishery began in 1961 and is now one of the most commercially important to the state. Tanner crabs are found throughout the North Pacific Ocean and Bering Sea along the continental shelf and coastal waters. Mature males typically weigh 1-4 pounds. Tanners are “true” crabs with four pairs of walking legs and one pair of pincers. Although C. opilio and C. bairdi are discreet species, they are able to crossbreed. 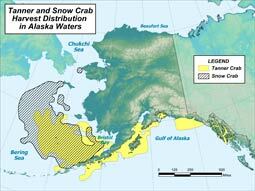 In fact, there are specific regions in the Bering Sea and North Pacific Ocean that contain high numbers of Tanner crab hybrids. The hybrid individuals display a mix of physical traits that are typically attributed to either of the two discreet species.